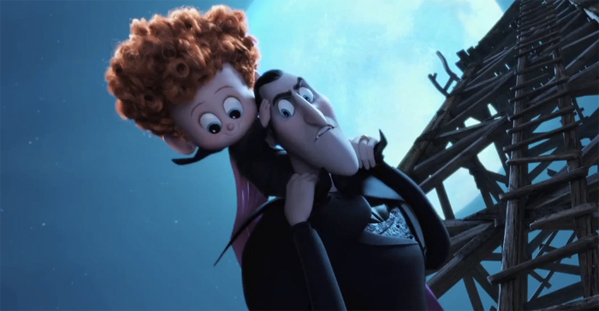 Since The Wolf Pack from The Hangover franchise isn't meant for children at all, parents will want to take their kids to see what is being dubbed "The Drac Pack" in the teaser trailer for Hotel Transylvania 2, the animated sequel from Sony Pictures Animation. Adam Sandler is back as Dracula, and in this teaser, he's teaching his half-human, half-vampire grandson how to fly by dropping him from a pretty big height. I wasn't in love with the first film in this series, but this teaser trailer is pretty amusing, especially when Frank (Kevin James) catches on fire. No sign of Mel Brooks as Drac's father Vlad yet though. Watch! Hotel Transylvania 2 is directed by Genndy Tartakovsky (Hotel Transylvania, Popeye) and written by Adam Sandler & Robert Smigel ("Saturday Night Live"). In the sequel, a family get-together in the follow-up feature brings Dracula's father Vlad (Mel Brooks) to town — along with some secrets and drama — to visit the estranged son he hasn’t seen in years. He turns everybody’s life upside down, from Drac, Mavis (Selena Gomez) and Jonathan (Andy Samberg) to hotel regulars such as Frank (Kevin James), Wayne Werewolf (Steve Buscemi) and Murray the Mummy (Keegan-Michael Key). The film will arrive September 25th. I'm gonna watch this. First one was above average.